Will you let the Unclimbable Ladder game live up to its name or can you make it up to the top of the suspended rope ladder and ring the bell before you lose your balance and fall off onto the inflatable mattress below? If that's not hard enough there's even more pressure as you'll be competing against an opponent on a second ladder suspended next to you. First person to the top and ring the bell wins! Our Unclimbable Ladder is a brilliant crowd drawing attraction that can be hired for fun days and fetes while also making a great team building game. 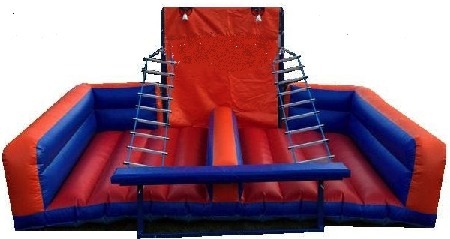 The game requires an overall operating space of 20x20ft with a height clearance of 10ft if the event is being held indoors. The Unclimbable Ladder is supplied with one of our friendly staff members who will supervise the game for you and ensure its safe use. If you have any queries, questions, or would like to hire the Unclimbable Ladder for your event please call us on the number below or click to enquiry and we will do all we can to help.